We met with Dr. Beam and Pebbles the wiggler at the Alvarado Vet Clinic this morning. He shared that Pebbles’ gunshot wound was the 2nd worst he has ever seen. 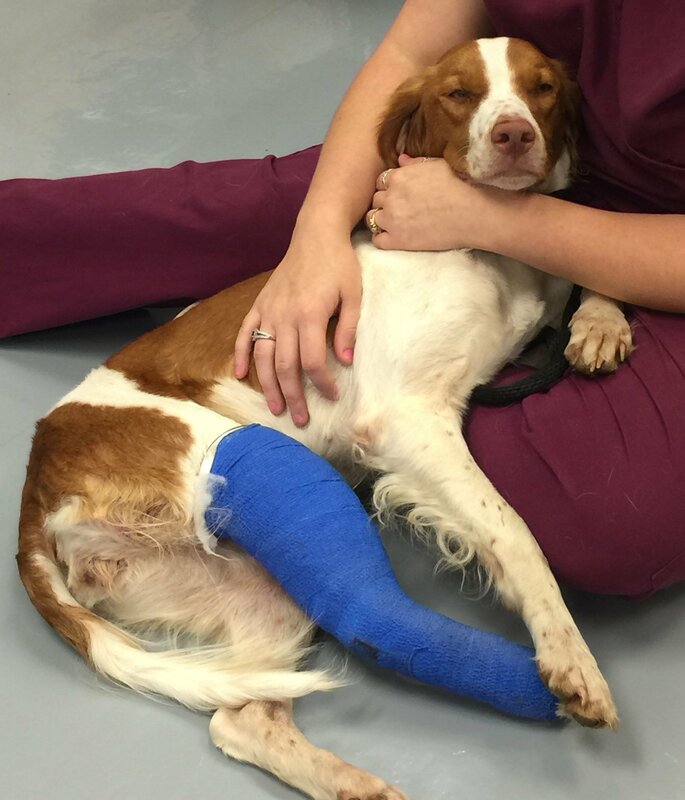 Despite a large amount of shattered bone, he is DETERMINED that this Brittany will recover 100% and keep her leg. After witnessing the bandage changing procedure documented below and a lengthy consultation with Dr. Beam and his surgical staff, it was decided that the best course of care for Pebbles would be for her to stay in the vet hospital for the next six weeks so THEY can change her bandages every five days. Here is the problem: Pebbles is such a happy, young, rambunctious, and high-energy Brittany (typical!) she has to be sedated to change her bandages. Poor Miss Pebbles! She is soooo ready to go and run and play! That cone and those pins are really cramping her style! 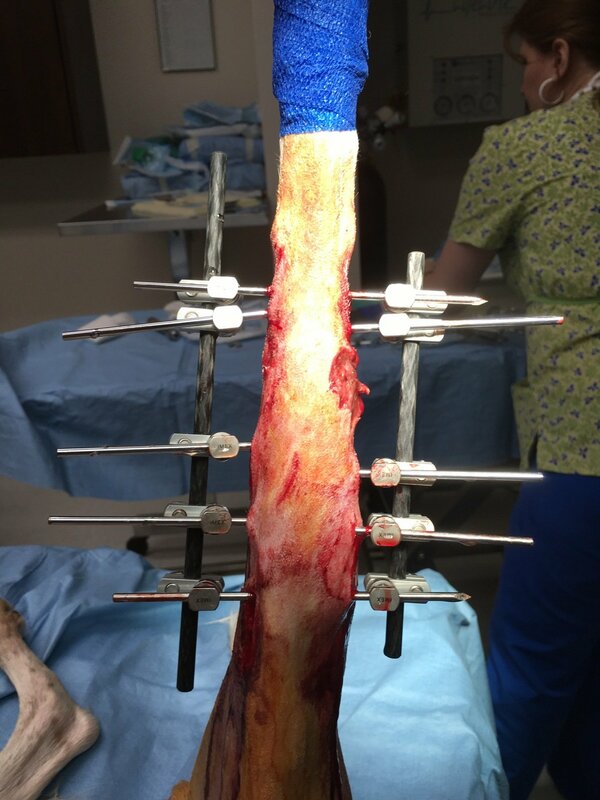 The good news is she is healing well and the doc feels she will be able to run with no problem as long as she STAYS STILL and doesn’t get the pins caught up on anything for the the next six weeks. 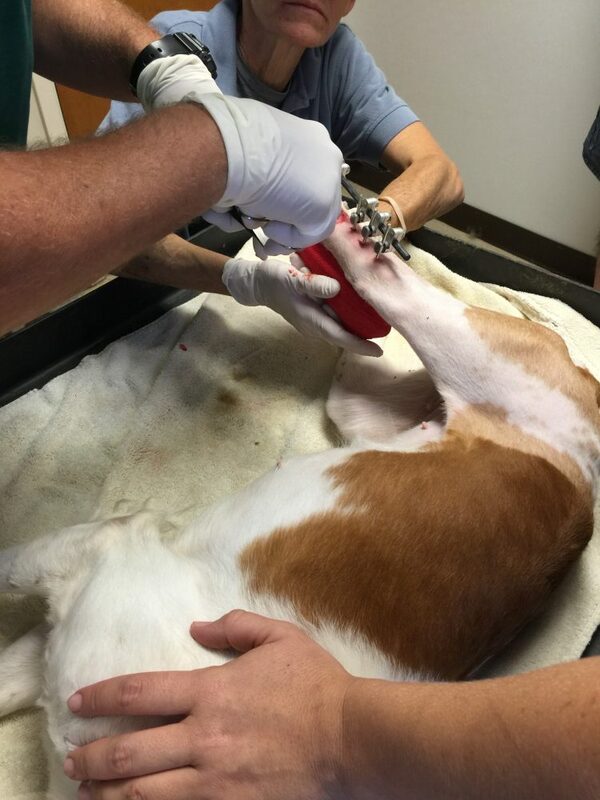 BRIT was able to pay today’s $2,459.51 vet bill today THANKS to your generous donations but we still need to raise enough money to cover the six weeks of aftercare which is estimated to be another $2,000….at least. Please share this story with your friends and help us raise the funds needed to cover Pebbles’ ongoing medical expenses. At BRIT we believe ALL LIFE IS PRECIOUS. Especially those of the innocents, and those who have no way of defending themselves like this beautiful Brittany. 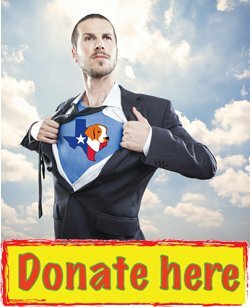 Please make your donations here – no donation is too small or too large. Pebbles sedated and ready for her bandage change. 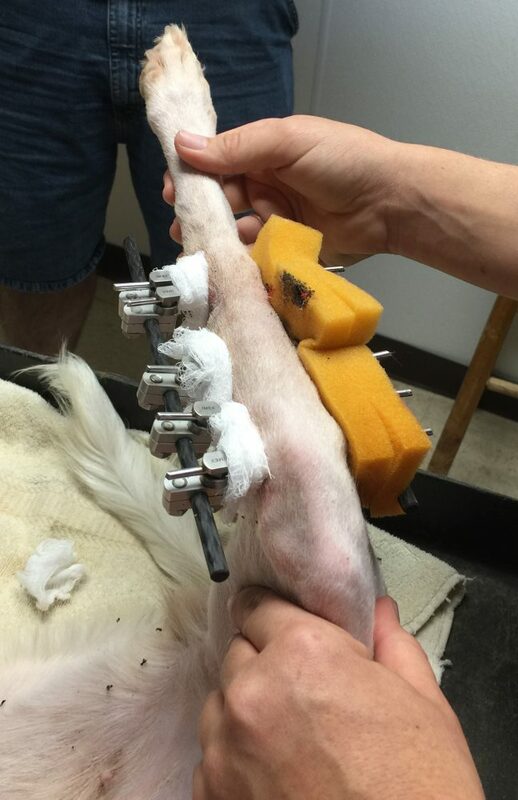 Carefully removing the padding around the rods. Pebbles came through her surgery with no complications. Apologies for the graphic photo – it was taken immediately post-op. She is on pain medication and is resting. 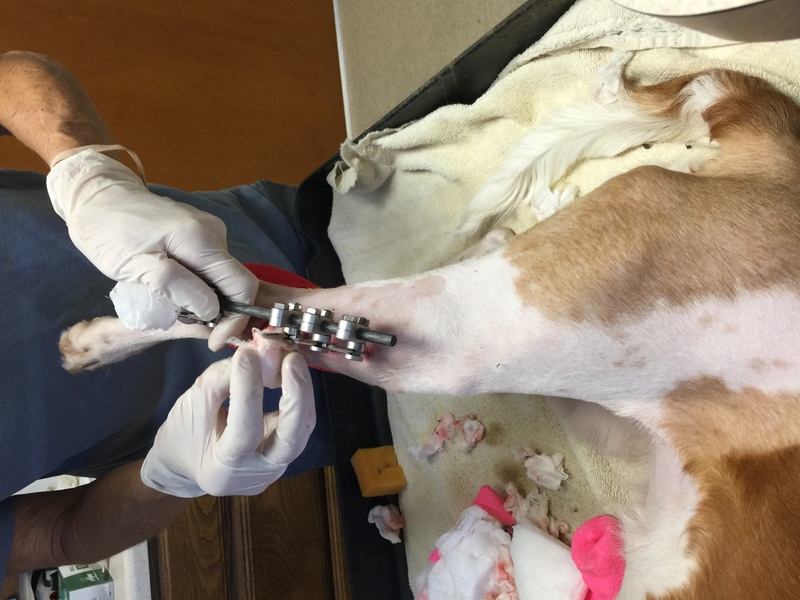 The vet tech say she is happy and wagging her tail! She will stay at Dr. Beam’s for another week. 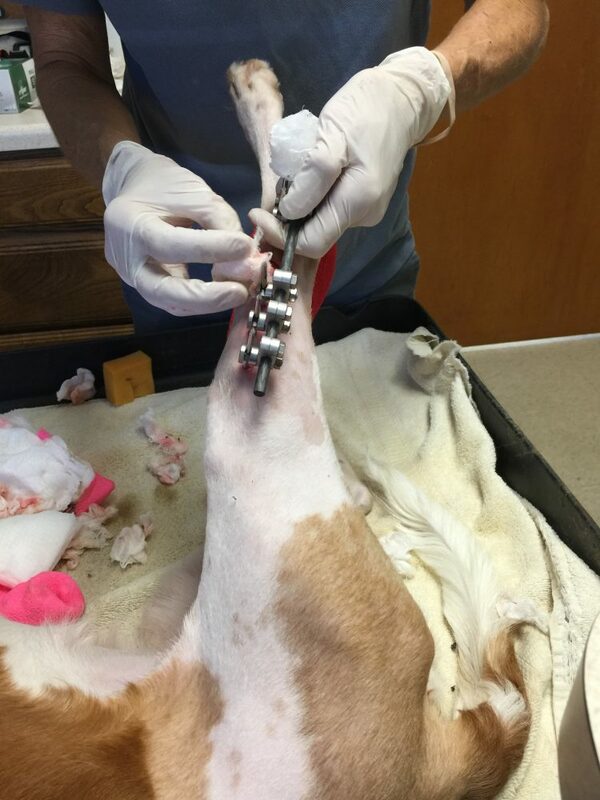 Pebbles was taken to the surgical center in Alvarado this morning and met with Dr. Kevin Beam. 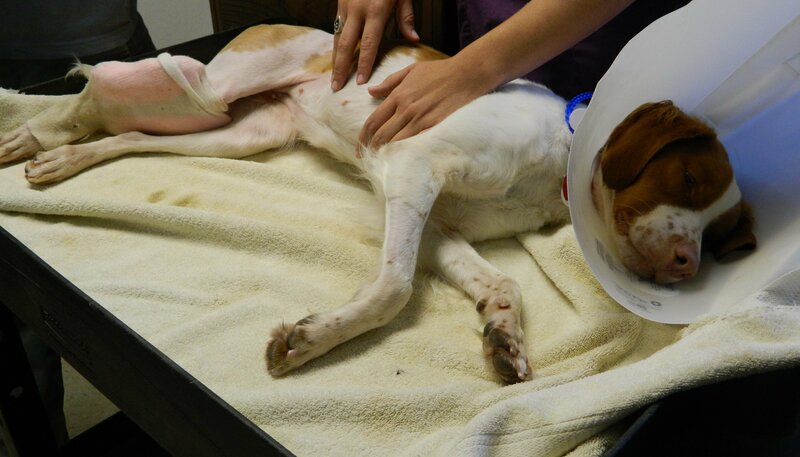 Below is a photo of Pebbles at the clinic with Dr. Beam plus his diagnosis – her surgery is scheduled for later today. Keep your prayers coming…there is a small chance she might lose the leg. 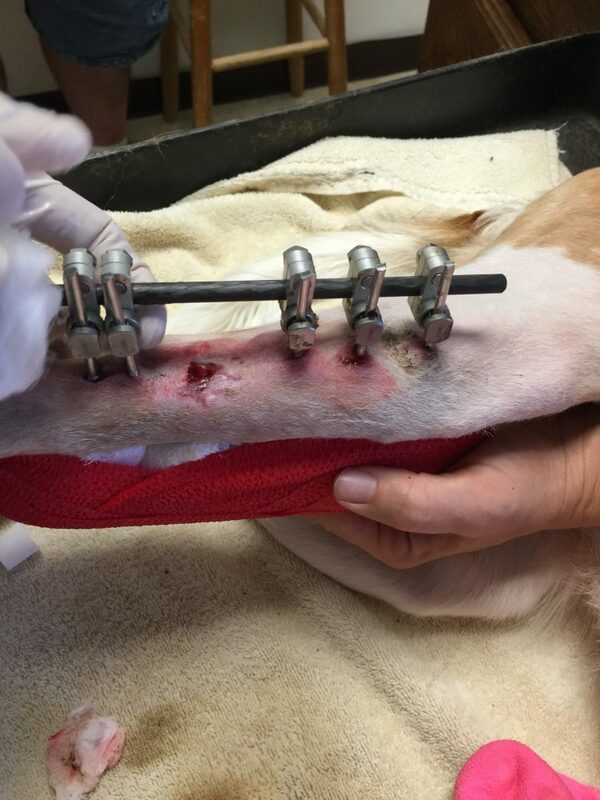 According to Dr. Beam there are still bullet fragments in her leg. Of course he won’t know exactly what he is dealing with until he gets in there, but expects to put a series of pins in her leg to stabilize it. She will need to stay hospitalized for a couple of weeks for recovery and rehab. FYI: A comminuted fracture is a break or splinter of the bone into more than two fragments. Since considerable force and energy is required to fragment bone, fractures of this degree occur after high-impact trauma (ex: gunshot from a hollow point bullet). A HUGE thank you to everyone who has already donated and shared Pebbles story – it’s helping a lot because the bills for this girl are mounting quickly even with the deep discount Dr. Beam is giving us. If you have not had a chance to donate to Pebbles please consider making a donation today – no amount is too small! 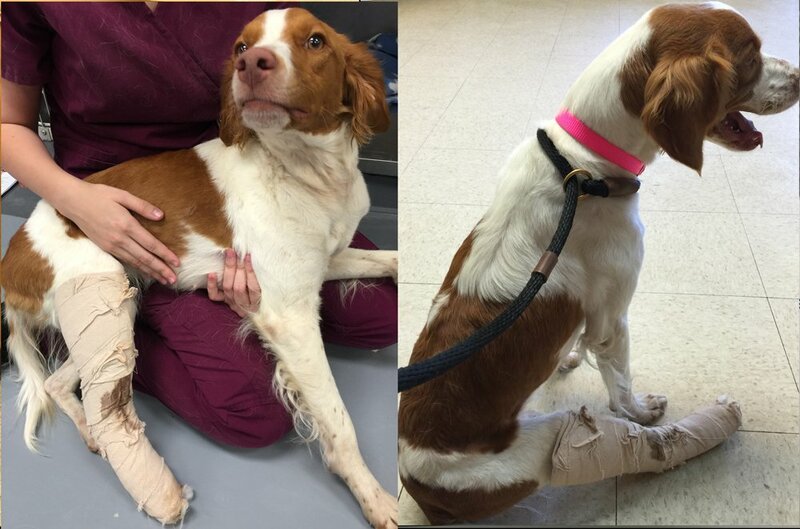 Tuesday afternoon our East Texas volunteer received a frantic notice from a shelter who had just admitted a female Brittany (about a year and a half of age) who had a shattered leg and was bleeding profusely. 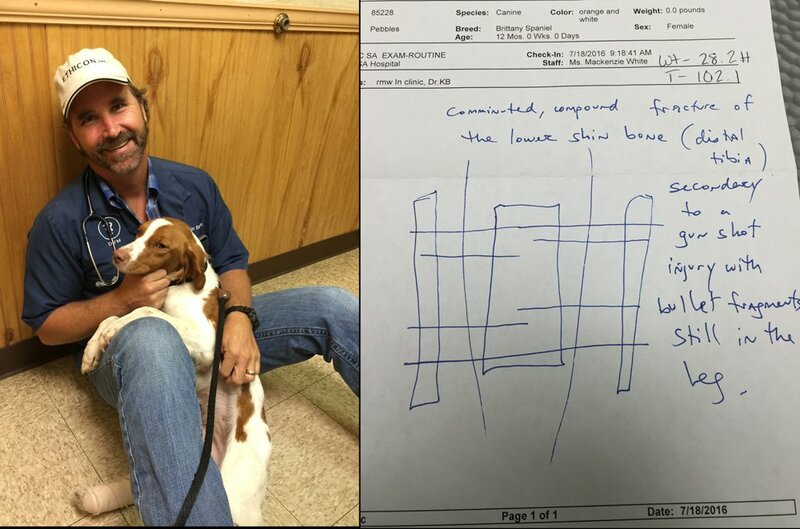 The man who dropped her off at the shelter said she had been “hit by a car”. …Oh, really? Hit by a car you say? The small East Texas shelter didn’t have the resources to get her vetted. 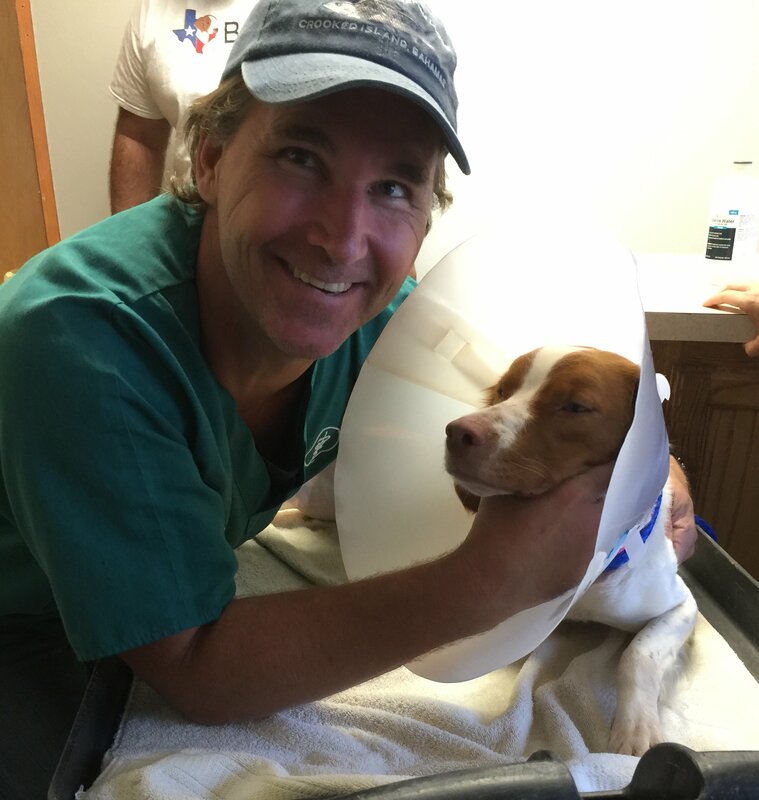 Fortunately, in lieu of euthanasia they called BRIT’s East Texas volunteer who rushed the Brittany, who we are calling Pebbles, to her local vet for triage. 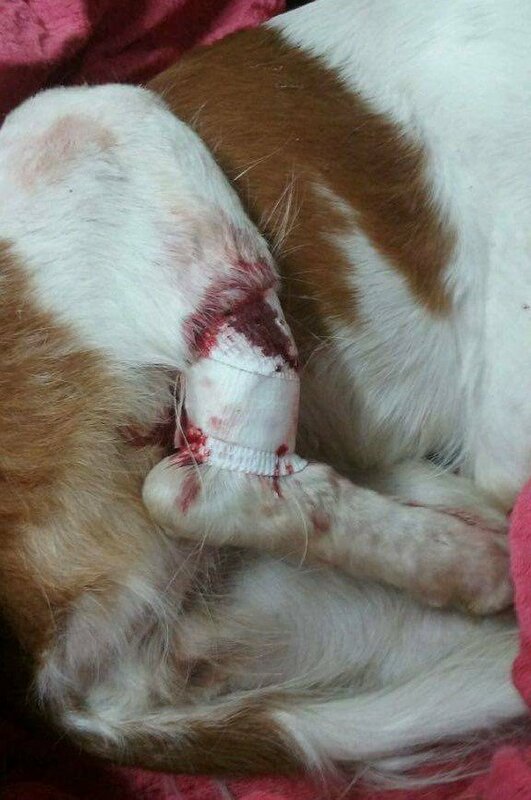 As it turns out Pebbles was NOT hit by a car, but SHOT in the leg. (Who would do such a thing???) 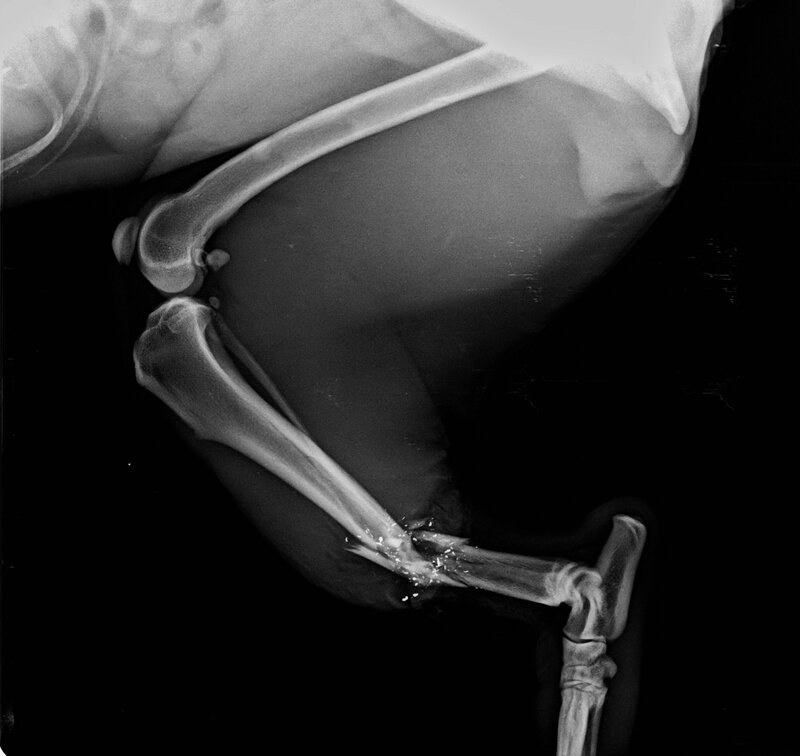 As you can see on the attached x-ray, the bullet shattered her right tibia. Fortunately, Pebbles is a healthy young adolescent and strong enough to come through this with flying colors. She is heartworm negative and in excellent health. As you can see from her photos she is absolutely gorgeous. The vet techs tell us Pebbles is very loving and trusting. 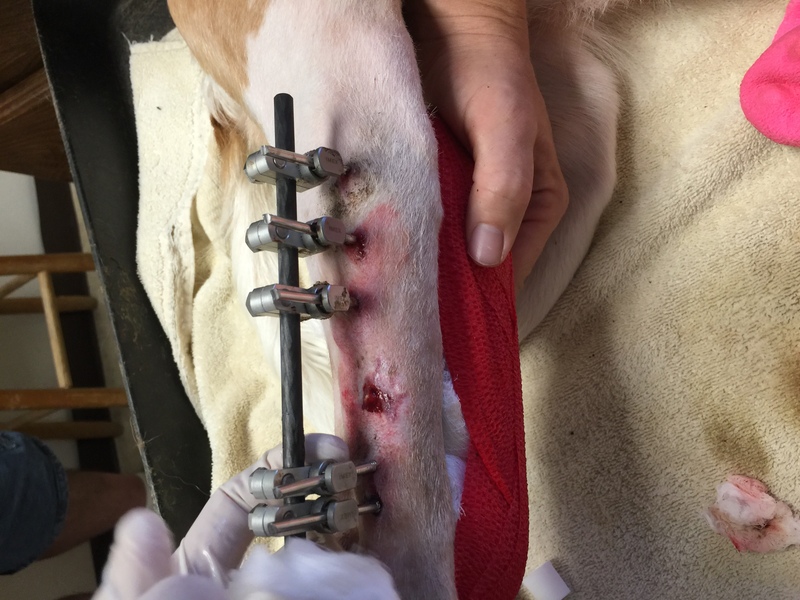 She continues a course of antibiotics and pain medication, while awaiting surgery on Monday. Traumatic animal injuries are always costly, but BRIT had a bit of good luck in finding a highly skilled and generous veterinarian in Alvarado, certified in advanced Orthopedic Surgery, who is willing to perform Pebbles’ operation for approximately $2,000…about a 1/3 of the cost of the “big city” fees, which can range between $5-6,000 and up. 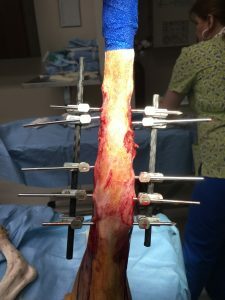 This does not include the cost of the triage vet or the post-surgery rehabilitation, which can run another $1,000 or more. It’s been a WILD week at BRIT! 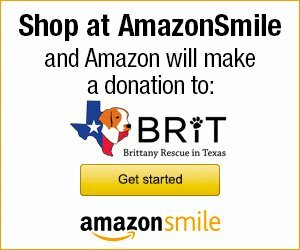 Join BRIT and your fellow Brittany lovers in our commitment to rescue Brittanys across the Great State of Texas. 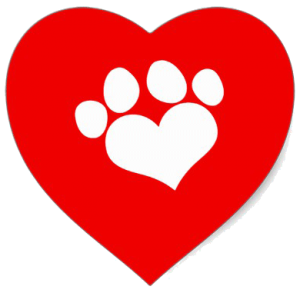 We are fortunate to have veterinarians that will work with us, but a wild week like this one very quickly wipes out our small emergency fund and threatens our ability to continue rescuing. Please visit our donation page and contribute – no amount is too small or too large.